AI+ How to Invest in AI? AI+ 2018 Summit “AI+ Investment” Panel: How to Invest in AI? For the second panel of the afternoon, Tom Cole (Advisor at Translink Capital), Eric Chen (Partner of OVO Ventures), and Marc Wang, (Partner at China Economic Cooperation Group) sat on the “AI+ Investments” panel moderated by Safa Rashtchy, founder and general partner of Think+ Ventures. Is there too much investment hype in AI? Is the valuation of AI reasonable? Moderator Safa Rashtchy began by presenting the technology hype cycle and technology adoption lifecycle as a launching point for discussion among the panelists. The panelists agreed that AI technology is currently in the late second stage of the technology hype cycle—the peak of inflated expectations. This indicates that AI is receiving a lot of attention from the public, giving the illusion of “success,” when in reality, many AI startups are unable to cope with the high expectations of both investors and consumers. 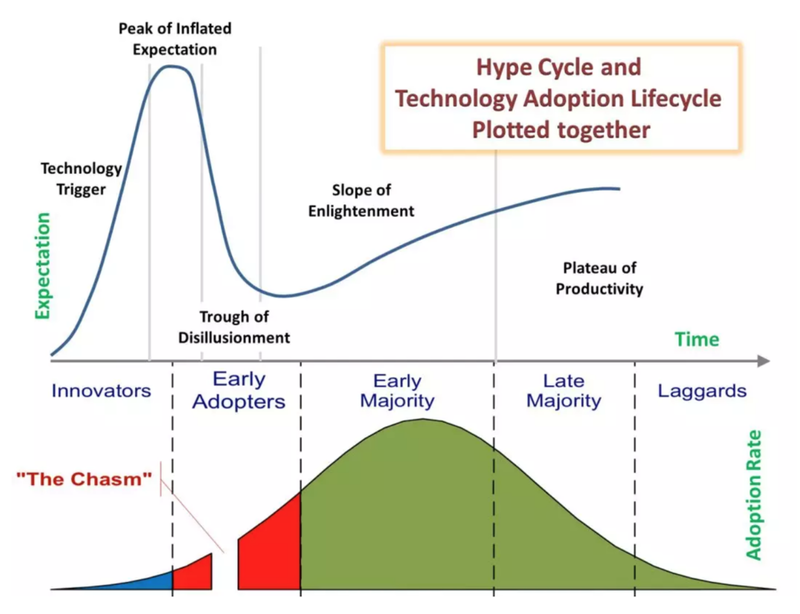 At the same time, the panelists placed AI in the early part of the second stage in the technology adoption lifecycle—the early adopters stage. This reflects that current consumers of AI only account for 5% of the total number of people who will eventually use AI. In other words, AI technology is far from prevalent. How should you invest in AI? The first thing to keep in mind is that AI is extremely broad and the technology can be applied to various fields. To invest successfully in AI, an investor first needs to define a narrower purview within the field of AI. An investor should invest in AI businesses that generate real commercial value rather than investing in businesses because of their AI technology. When evaluating early-stage ventures, an investor should look into the entrepreneurial experience, past startup successes, and other skills of the startup team. Moreover, the team needs to have defined a solution for consumer pain points in specific user application scenarios. Investors should determine if these startups have the appropriate AI technology that will enable them to solve the problem(s) they set out to solve. Finally, these startups need to have some way to obtain data, particularly 2C projects, which need enough data to compete with industry giants in a specific segment of the market. Where are the investment opportunities in AI? The panelists believed that there was a bright future for AI investment in fields such as autonomous vehicles, internet of things (IoT), financial technology, healthcare, and education. Among those, AI will most likely disrupt the healthcare industry, because of the high demand as well as AI’s ability to reduce healthcare-related costs and improve the quality of service. At the same time, the panelists also advised investors that due to the particularities of the healthcare industry, they should consider the impact of relevant policies and regulations on the application of AI technology in the healthcare industry.